Take a crack at this Southern spin on a traditional Passover treat. But it’s not only relegated to the holiday. 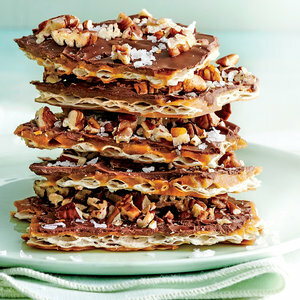 In fact, you can make this sweet snack year-round using saltine crackers for a crispy, salty base that makes the chocolate and pecans pop in your mouth. So do yourself a favor and indulge! 1. Preheat oven to 350°F. Line an 18- x 12-inch rimmed baking sheet with heavy-duty aluminum foil. Grease foil with butter. Arrange matzos in prepared pan, breaking as necessary to fit and completely cover bottom. 2. Bring 1 cup butter and brown sugar to a boil in a heavy saucepan over medium, whisking occasionally. Boil, whisking constantly, 3 minutes. Carefully pour mixture over matzos; spread over matzos. 3. Bake in preheated oven until bubbly all over, 8 to 10 minutes. Carefully remove baking sheet from oven to a wire rack. Let stand 1 minute. Sprinkle chocolate chips over top; let stand until chips soften, about 2 minutes. Spread chocolate over brown sugar mixture. Sprinkle with pecans; sprinkle with salt, if desired. Let stand at room temperature 30 minutes. Chill toffee until firm, about 30 minutes. Break or cut into about 36 pieces. Store in an airtight container up to 1 week in refrigerator.